The factory of gas appliances UNIS-FAGAS d.o.o. Sarajevo was established in 1997. The main activity of our company is the design and manufacturing of gas measurement and control equipment, as well as its installation upon customer request. Apart from the former Yugoslavia market, UNIS-FAGAS exports its products to North America, Scandinavia, Germany, as well as the Near and Far East. UNIS - FAGAS has introduced a quality system ISO 9001:2000 since December 2001.and in their business policy that seeks all their products certified by the competent institutions of the BAS-EN standards. 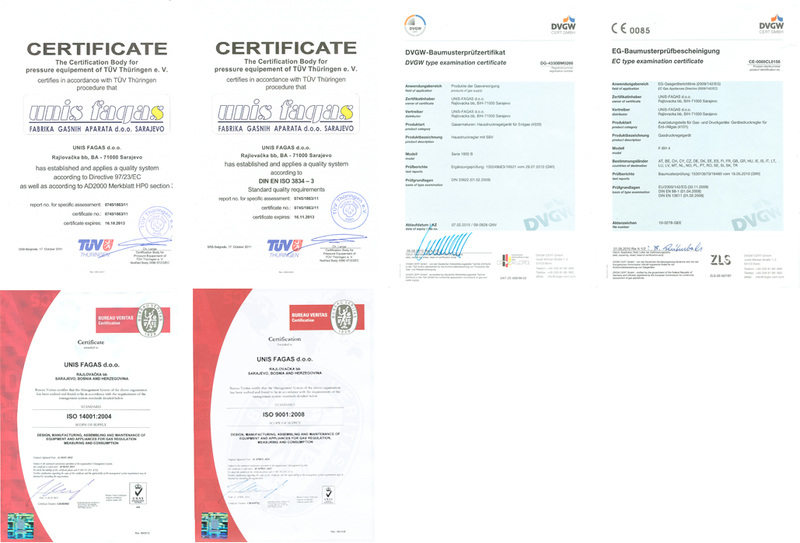 In addition to the certification of products by domestic institutions SMP (Institute for Standards and Metrology ITA), UNIS - FAGAS certifies its products by the German association for air, gas and water DVGW and Canadian - American Gas Association CSA, which means that our products are tested in the laboratories of the Institute of gas technology, Werma Gas Institute in Essen's (CSA International). These controllers offer an economical and accurate pressure regulation in a variety of applications. "Natural gas in the light of new intentions in the energy market"